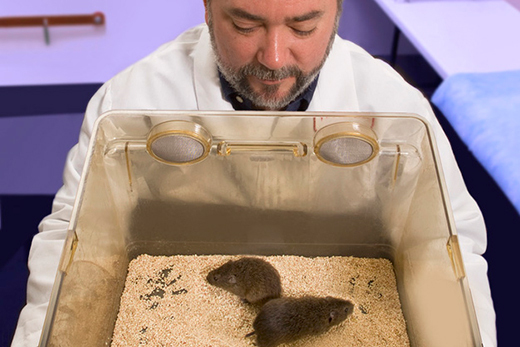 Emory researchers Larry Young (pictured) and James Burkett demonstrated that oxytocin — a brain chemical well-known for maternal nurturing and social bonding — acts in a specific brain region of prairie voles, the same as in humans, to promote consoling behavior. A discovery of consolation behavior in prairie voles ends the long-standing belief that detecting the distress of others and acting to relieve it is uniquely human. Researchers at the Yerkes National Primate Research Center, Emory University, have discovered that a social laboratory rodent, the prairie vole, shows an empathy-based consoling response when other voles are distressed. This is the first time researchers have shown consolation behavior in rodents, and this discovery ends the long-standing belief that detecting the distress of others and acting to relieve that stress is uniquely human. Making this finding even more significant is that it has important implications for understanding and treating psychiatric disorders in which detecting and responding to the emotions of others can be disrupted, including autism spectrum disorder (ASD) and schizophrenia. In the study, which is published in this week’s issue of Science, co-authors Larry Young, PhD, and James Burkett, PhD, demonstrated that oxytocin — a brain chemical well-known for maternal nurturing and social bonding — acts in a specific brain region of prairie voles, the same as in humans, to promote consoling behavior. Prairie voles are small rodents known for forming lifelong, monogamous bonds and providing bi-parental care of their young. Consolation is defined as calming contact directed at a distressed individual; for example, primates calm others with a kiss and embrace, whereas voles groom others. The prairie voles’ consoling behavior was strongest toward familiar voles, and was not observed in the closely related, but asocial, meadow vole. Study co-author Frans de Waal, PhD, was the first to discover animal consolation behavior in 1979 by observing how chimpanzees provide contact comfort to victims of aggression. According to de Waal, the present vole study has significant implications by confirming the empathic nature of the consolation response. “Scientists have been reluctant to attribute empathy to animals, often assuming selfish motives. These explanations have never worked well for consolation behavior, however, which is why this study is so important,” says de Waal. Young is division chief of Behavioral Neuroscience and Psychiatric Disorders at Yerkes, director of the Silvio O. Conte Center for Oxytocin and Social Cognition at Emory, and professor in the Emory University School of Medicine Department of Psychiatry and Behavioral Sciences. His previous research on the neural mechanisms controlling pair bonding in prairie voles has provided insights that may be relevant to the treatment of ASD. De Waal is director of the Living Links Center at Yerkes National Primate Research Center, Professor of Primate Behavior in the Emory University Psychology Department, and University Professor at Utrecht University, The Netherlands. De Waal has published several books on primate social behavior and animal empathy, including The Age of Empathy. Burkett recently completed his doctoral studies in Emory University’s Neuroscience PhD program. In addition to being the first study to show consolation outside of large-brained animals, the researchers explicitly tied consolation to maternal nurturing mechanisms in the brain, which suggests empathy, not complex cognition, is key. Observing another animal in distress caused activation in the anterior cingulate cortex, a brain region that is also activated when humans see another person in pain. Prairie voles responded by increasing their pro-social contact, which clearly reduced the other’s anxiety. When the study authors blocked oxytocin signaling specifically in the anterior cingulate cortex of prairie voles, the animals no longer consoled others in distress. According to Young and Burkett, research suggests oxytocin may improve social engagement in ASD. Their research findings create an opportunity to explore the neural mechanisms of this previously unrecognized consolation behavior in laboratory animals, placing greater emphasis on research into the brain systems underlying empathy. This research underscores the increasing potential oxytocin has for understanding and treating ASD, schizophrenia, and other psychiatric disorders in which detecting and responding to the emotions of others can be disrupted. “Many complex human traits have their roots in fundamental brain processes that are shared among many other species,” says Young. “We now have the opportunity to explore in detail the neural mechanisms underlying empathetic responses in a laboratory rodent with clear implications for humans,” Young continues. 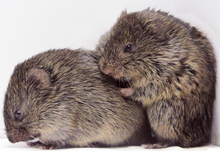 The authors suggest that consoling behavior evolved in the context of prairie voles’ monogamous social structure by tweaking brain systems involved in maternal nurturing, which are present in all mammals. Research reported in this release was supported by the U.S.-based National Institute of Mental Health under award number P50MH100023 and R01MH096983 and the National Institutes of Health’s Office of the Director, Office of Research Infrastructure Programs, P51OD011132. For eight decades, the Yerkes National Primate Research Center, Emory University, has been dedicated to conducting essential basic science and translational research to advance scientific understanding and to improve the health and well-being of humans and nonhuman primates. Today, the center, as one of only eight National Institutes of Health–funded national primate research centers, provides leadership, training and resources to foster scientific creativity, collaboration and discoveries. Yerkes-based research is grounded in scientific integrity, expert knowledge, respect for colleagues, an open exchange of ideas and compassionate quality animal care. Within the fields of microbiology and immunology, neurologic diseases, neuropharmacology, behavioral, cognitive and developmental neuroscience, and psychiatric disorders, the center’s research programs are seeking ways to: develop vaccines for infectious and noninfectious diseases; understand the basic neurobiology and genetics of social behavior and develop new treatment strategies for improving social functioning in ASD and schizophrenia; interpret brain activity through imaging; increase understanding of progressive illnesses such as Alzheimer’s and Parkinson’s diseases; unlock the secrets of memory; treat drug addiction; determine how the interaction between genetics and society shape who we are; and advance knowledge about the evolutionary links between biology and behavior. The CTSN mission is to bring together basic and clinical scientists in order to facilitate the translation of our understanding of the social brain into novel treatments for social deficits in psychiatric disorders, including ASD.